Colouring books come in all shapes and sizes, aimed at various tastes and age groups. From the very young to the more mature members of society there's something for everyone. 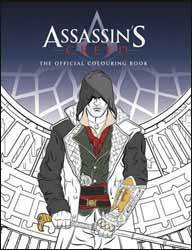 This official Assassin's Creed colouring book includes many scenes inspired by the video game series as well as pages given over to weapons from the franchise. There's something here for everyone, from the colouring novice to those who want to use them to produce beautiful watercolours or oil paintings. I'd recommend scanning the pages in and printing them off. That way you can even increase the size of the illustrations as well as try various different styles on the same picture. The back section has a handful of full colour paintings of some of the illustrations throughout the book - to give you a little inspiration and something to work towards. It's great to see a publisher attempting to get kids off their consoles by enticing them with something they are familiar with. This is another interesting book to add to your colouring book collection.